The western and southwestern parts of Uganda are known to be the most rewarding locations for tours and safari guests in Uganda. One of the sweet ingredients of this area is a Lake called Bunyonyi; a name it gets because of its great assemblage of bird species. The local people in the area named it Bunyonyi which translates as “the place of many little birds”. 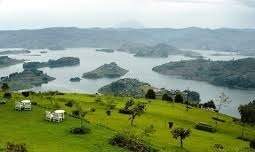 Yes, Lake Bunyonyi is located in southwestern Uganda between the districts of Kisoro and Kibale and its shores are just seven (7) kilometers from the town of Kabale (which is popular for its terraced hills). It covers a total area of 61 square kilometers and is believed to be one of the deepest lakes in Africa; but this has not yet been proven. The lake is an Important Birding area and attracts both domestic and international guests on birding tours and safaris to Uganda. The lake is just something for the eye to delve upon but surprisingly, there is not a lot of literature written about it, neither are there many blogs that talk about Bunyonyi as a place that tourists must see during their lifetime. This is one place that no vacationer deserves to miss when on a Safari or tour in Africa and is definitely one of the treasures that Uganda ought to boast about. Apart from the bird species which delight in the Lake Bunyonyi water or others which tread softly along the shores, Lake Bunyonyi is popular for its watersports. Fish were first introduced in this lake at the opening of the 20th century and fishing peaked in the early 1930s. Although large-scale fishing has been replaced by subsistence fishing because of the reduction in the number of fish; the lake still has a variety of fish species like the tilapia, mudfish, cat fish, a few Nile Perch and lung fish. Uganda Safari and tours guests can enjoy sport fishing in Lake Bunyonyi. The lake is surrounded by a number of terraced hills and its waters are segmented by up to 29 freestanding Islands. It is startling how closely located the islands are to each other and you could actually count over fifteen (15) of them from one of the surrounding hills. Some of the famous islands include Akampene (Punishment Island) and the Bucuranuka Island. Akampene Island is where the Kiga people used to bring girls who had lost their virginity before marriage. The girls were dumped here to waste with hunger and this served as an example to the girls in the community. The Bucuranuka Island has a different story all together and is considered a doomed island. The inhabitants of this can narrate that one day an old lady on the island begged for a drink of local beer from a group of twenty (20) men on the Island but they turned down her humble request and sent her in a canoe to the mainland accompanied by one of the younger men. On reaching the mainland, the old lady cursed the island and it capsized killing all those who were on the island. Bold tourists can enjoy a canoe ride to some of the Islands on Lake Bunyonyi. There is also a neighboring village called Bufuka where visitors are welcome to experience the cultures of the Batwa and Bakiga people. Tourists can even get a chance to join the locals’ daily routine like dancing and singing or weaving. The lake’s waters rise to an altitude of 1,950m and the climate around the lake is cool and ideal for spending a night or two out of your Safari in Uganda. There are many comfortable tourist accommodations near the lake and in the neighboring towns. The captivating vistas of Lake Bunyonyi and its surrounding make it one of the best holiday locations in the world.